Shade sails or sun shades offer one of the best and very practical solutions for those who are looking for a temporary or semi-permanent shade structure for their homes or businesses. Their various sizes, shapes and colours makes them very versatile and can be used for both domestic and commercial applications like in swimming pools, patios, decks, gardens, car park, playground – basically anywhere that needs protection from the sun. They are not as expensive as having a roof built as well, since most shade sails sell somewhere between $100 to $500 or more. When it comes to purchasing shade sails though, there are certain things that you need to consider. 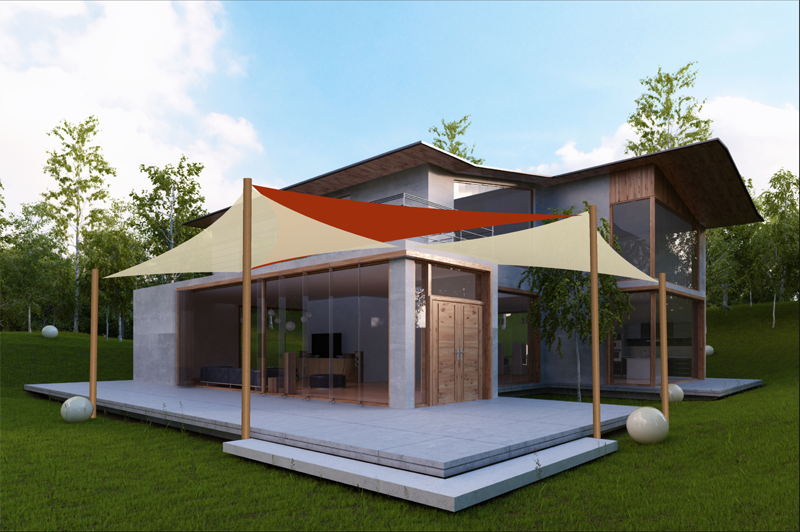 Remember that these shade sails are going to be part or an extension of your property, and that being said, you should definitely invest in a good quality shade sail instead of the cheaper alternatives. But how exactly do you differentiate a quality grade shade sail from those which are not? Whether you are buying a shade sail for the first time or looking for a replacement, here are some information that can help you distinguish between good and bad shade sails. As much as possible, always choose to buy shade sails from reputable and credible manufacturer, as this is one way of making sure that you are getting your money's worth. In Australia, there are several shade sail manufacturers, and one of the most popular and trusted brands is Coolaroo. Coolaroo has been in the business of making shade sails and other outdoor living products like umbrellas and others for decades, and they wouldn’t have lasted that long if they weren’t producing quality shade sails. Besides, Coolaroo is not only popular in Australia, but has gained world-wide audience as well. The fabric used in shade sails is very different from ordinary cloth. The industry standard is high density polyethylene (HDPE) fabric, which is usually lightweight and breathable, but still tough enough to endure the wear and tear brought about by the extreme Australian weather. Shade sails with HDPE fabric also stays in shape and retains its colours for a long time, thus making sure that you have an appealing shade sail over the years. There are different types of fabric that you can choose from, the most popular being permeable fabrics. They provide excellent ventilation because of its ability to allow the wind to pass through. This also makes them better come during windy times because the air passes through and not much tension is created on the rigging and shade sail, and thus lessens the pressure on the anchor points. Shade sail fabrics should be able to resist mould and mildew formation as well, so check if the fabric has coating, and if it does, make sure that it is not cracked or does not peel off. Good quality shade sails do not only protect you from the heat of the sun, but also from the harmful ultraviolet (UV) rays it emits. When buying a shade sail, be sure to ask about its UV block percentage, both the minimum and maximum numbers. In general, a quality shade sail should be able to block out more than 90% of the sun’s UV rays, whereas a shade sail of poor quality can only provide lesser protection, if any at all. You also need to check the quality or the d-rings and steel cables that come along with the shade sail you buy. D-rings and steel cables of poor quality tend to bend or snap easily. You should check that the d-rings are sewn sturdily to the shade sail, since this will ensure that they do not turn and twist whenever a slightly strong wind is blowing. The seams, by the way, should be evenly spaced and uniformed, and the edges are sewn with dual-layered belt instead of the common turned-and-sewn pattern. When it comes to rigging, choose steel cables over ropes. Steel cables are tough and strong, and a good steel cable should be able to hold the weight of shade sail and handle the pressure exerted by both the weight and the wind. A good quality steel cable should also be able to hold up your shade sail without you having to re-tension or re-adjust them every now and then. Every good and high quality shade sail is backed up by a warranty, and don’t settle for a one year warranty. If the shade sail is as good as the seller says it is, they should be brave enough to give you at least a 5 year warranty. The Coolaroo Charcoal Extreme rectangle 5m x 3m Shade Sail for example is backed up by 10 years warranty. If there are signs that UV Damage is detected on the shade sails they can be replaced. If you are serious about having a shade sail that is not only visually striking but also serves its purpose well, then be sure to invest in a good quality shade sail – they are not only functional but practical solutions for your shade needs as well.